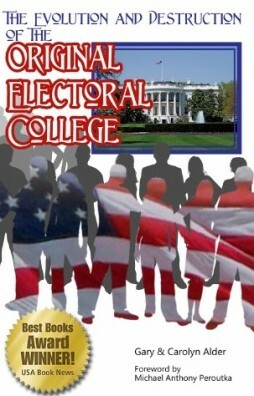 The nomination process was accomplished by the Electoral College and amounted to a weighted vote. The reason for using the total congressional representation, Senators and Representatives, rather than only the number of Representatives, was to give smaller states more say in nominating possible presidential candidates, without disadvantaging larger states. The candidate selection was to take place as the nominations were opened and counted in a joint meeting of both houses of Congress. A field of up to 5 candidates was thereby created. An overwhelming nomination of a particular individual coming from the Electors (who were expected to be independent of outside influence) was taken as the will of the people and was not to be overridden (the shortcut). In other words if the President were selected by the Electors’ nominations, it would be by coincidence rather than by strategy. Unless a majority of the total number of Electors nominated the same individual, as determined in the joint meeting, a field of up to five candidates would go to the House of Representatives where each state, regardless of population, would have an equal vote for the President. When we were kids, our mothers taught us that in order to share a cookie or a candy bar with a friend, we would cut it in half; our friend would then choose his piece first. It is only fair. This is analogous to the situation with the electoral system. The Electors as independent representatives of the people, nominate the candidates; the House of Representatives decides which of those candidates becomes President. Each state casts one vote. It is apparent that the Framers were overly optimistic in expecting a consensus of the nominations coming from the Electoral College. Perhaps they thought that some outstanding individual like George Washington would become obvious to the Electors. In our opinion, there is no indication that the selection of a president by the House of Representatives was initially thought to be a big problem. Within a few years, however, this did become an issue. fall to the lot of any man, who is not in an eminent degree endowed with the requisite qualifications. Alexander Hamilton indicates that this process of election (including the nominating role of the college of Electors) is what assures the high quality of presidential candidates. In our day, the words used by partisan candidates while campaigning under our current methods of election show that none of the candidates think of their opponents as endowed with superior qualifications. Talents for low intrigue and the little arts of popularity may alone suffice to elevate a man to the first honors in a single state; but it will require other talents and a different kind of merit to establish him in the esteem and confidence of the whole union, or of so considerable a portion of it as would be necessary to make him a successful candidate for the distinguished office of president of the United States. It will not be too strong to say, that there will be a constant probability of seeing the station filled by characters pre-eminent for ability and virtue. The method of selection of presidential Electors and presidential candidates is wholly to be credited with this prediction. A presupposition that wise Electors who know how to nominate individuals of character, experience, virtue, and integrity underlies the whole process. The wisdom and integrity of the Electors is essential. The independence of the Electors (that they are not “owned” by any group) is even more crucial. For the system to work, Electors must know how to choose—not be told who to choose. If the Electors are chosen by the people, then some process for nominating superior Elector candidates from whom the people can choose must be found. –yet we may safely pronounce, that the true test of a good government is its aptitude and tendency to produce a good administration. This speaks to the strategy of the electoral process as designed in the Constitution. In other words get a good administration with good leaders time after time by the process rather than by politics or just plain luck. It should be noted that if the House of Representatives chooses a candidate on the list other than the one with the highest number of electoral votes, the one with the highest number of votes will become Vice-President. In other words, the person with the most electoral votes will either be President or Vice- President. Either way, we get a President and a Vice-President selected individually from the list of the best candidates the system could produce. The appointment of an extraordinary person, as vice-president, has been objected to as superfluous, if not mischievous. [Why would anyone object to having the second most qualified person in the nation as the vice-president?] It has been alledged, that it would have been preferable to have authorized the senate to elect out of their own body an officer, answering that description. But two considerations seem to justify the ideas of the convention in this respect. One is, that to secure at all times the possibility of a definite resolution of the body, it is necessary that the president [of the Senate] should have only a casting vote. And to take the senator of any state from his seat as senator, to place him in that of president of the senate, would be to exchange, in regard to the state from which he came, a constant for a contingent vote. In other words, if a Senator were chosen as the President of the Senate he could only vote as a tie breaker rather than as a representative of his state. His state therefore would be under-represented. If one considers the Senators as just members of another body for passing national legislation, or as additional representatives of a political party, he would miss the critical nature of this argument. The other consideration is, that as the vice-president may occasionally become a substitute for the president, in the supreme executive magistracy, all the reasons, which recommend the mode of election prescribed for the one, apply with great, if not with equal, force to the manner of appointing the other. It is remarkable, that in this as in most other instances, the objection, which is made, would be against the constitution of this state. We have a Lieutenant Governor, chosen by the people at large, who presides in the senate, and is the constitutional substitute for the Governor in casualties similar to those, which would authorise the vice-president to exercise the authorities and discharge the duties of the president.